From mid-September to early November, Montreal's many trees reveal an array of colors that, believe it or not, are present year-round. Yellows, oranges, and reds are hidden from view in warmer months by the green pigment chlorophyll, a molecule crucial to photosynthesis that begins disappearing from leaves as days grow shorter and temperatures drop. And while you could pick any city park to get an eye full, these Montreal fall foliage destinations are particularly picturesque, if only for the variety of tree species they offer, a mix of shapes and colors you just can't find everywhere. Or even anywhere, given that some of these top picks feature unique collections of rare tree species that don't naturally grow together outside of arboretums. Add to that the fact that some of these locations are smack in the middle of Montreal's nightlife, spa, and restaurant scene, and you've got yourself the makings of the most worldly leaf-peeping experience you could possibly have in North America in the span of 24 hours. One morning, you're on a cobblestone road overlooking water lined by technicolor trees, eating the perfect sandwich en route to the closest museum or ​Gothic cathedral. By afternoon, you're in galoshes walking through the woods practicing your French. Come evening, you're dining on steak tartare followed by a local ice wine digestif. One last thing. Don't forget to check the Quebec Fall Foliage Report for details on the best time and location to catch fall colors in full bloom across the province of Quebec. It varies every year. Mount Royal Park? A no-brainer come fall in Montreal. Now don't get us wrong. Montreal's sort-of-mountain-plopped-in-the-middle-of-the-city is a no-brainer destination year-round, but if crisp leaves and colors are what you seek, Parc du Mont-Royal has it in every direction. Adjacent to as well as part and parcel of Mount Royal Park, Mount Royal Cemetery might be the final resting place of loved ones, but it's teeming with life, its macabre facade doubling as an arboretum of rare tree species that include Japanese lilacs, crabapple trees, Kentucky coffee trees, and chestnut trees. You might even spot a hawk or one of the other 145 migrating birds that populate the area. It's simply one of the most beautiful places in Montreal, on par with the awe the tallest point of the city inspires. 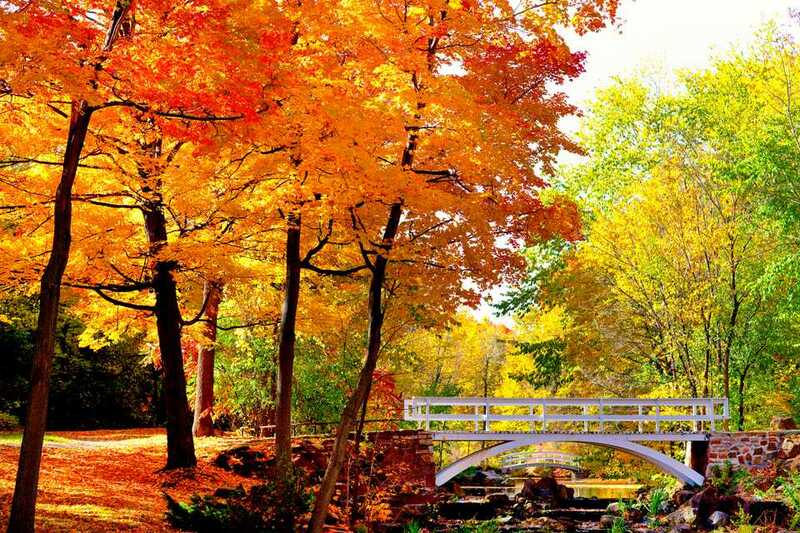 Unfortunately, admission to these grounds isn't free, but the Montreal Botanical Garden gives your buck a bang in the fall: Its popular annual lanterns event coincides with Montreal's fall foliage season. The lanterns are best viewed at sundown so consider dropping by the garden's arboretum in the late afternoon for a peaceful stroll before making your way to the main attraction in the Chinese garden. If you're walking in these 400 acres of old-growth hardwood and silver birch forests surrounded by picturesque streams, don't be surprised if you run into a fox while meandering along Bois-de-Liesse Park's trails. This out-of-the-way park is one of Montreal's best-kept secrets. A forest reserve on the western tip of the island of Montreal, Morgan Arboretum is home to 330 horticultural species, 40 of which are indigenous to Canada, all on protected land as part of McGill University's Macdonald Campus. And the view come leaf-peeping season is everything you would want on an autumn's day excursion in the woods. The arboretum itself is used for teaching, research, and everyday public enjoyment with 25 kilometers (15.5 miles) of walking trails. Note that a modest admission fee is required to gain access to the grounds; the proceeds are used for preserving the arboretum. First time in Montreal? Get thee to Old Montreal or more specifically, the Old Port. The earlier in the day, the better. It's magic. Fall foliage colors are in full bloom by the water by late September and early October. Just head for Marche Bonsecours and you'll get the lay of the land and catch a view of the waterfront and the Clock Tower. Floralies Gardens' cotton ball treetops and weeping willows are a sight for sore eyes any season, and but there's no better time to go than during Quebec's fall foliage season. The gardens and public art pepper the grounds of Parc Jean-Drapeau. Parc Angrignon ​is gorgeous. It's got waterfalls and streams, weeping willows, ponds, and hidden paths lined by berries, and it's conveniently located. No car required. Just hop on the Metro and get off at Angrignon, the last station on the western end of the Green Line, which is only a 10-minute subway ride from downtown Montreal, and boom, you're there. Within two minutes of exiting the station, you forget you're in a city altogether. At a gentle, exploratory pace, you could spend an afternoon walking through this peaceful park. Best reached by car or by bicycle, Bois de l'Ile Bizard is about as far removed from the city center as you can get while still remaining within city limits. It's on the northwestern island and Montreal borough Ile Bizard. There's a beautiful eeriness to the marsh grounds as you walk its lengthy boardwalks and surrounding woods' isolated paths.